The route is asphalted, circular, with St George Lycabettus Hotel as the starting and finishing point. The runners will move clockwise on the ring road of Lycabettus. The Road 5.5 Km race will be completed by covering two (2) laps. The Road 11 Km race will be completed by covering four (4) laps. The route is mainly dirt road, with St George Lycabettus Hotel as the starting and finishing point. The runners will move on the hill of Lycabettus and reach the top of it. The Trail 4.5 Km race will be completed by covering one (1) lap. The Trail 9 Km race will be completed by covering two (2) laps. The Lycabettus Relays 11 Km (2 x 5.5 Km) race will be completed by covering four (4) laps. The route is asphalted, roundabout, with St George Lycabettus Hotel the starting and finishing point. The runners will move clockwise on the ring road of Lycabettus. The top three in each category are awarded (Men - Women). Digital Qualifying Diploma for all runners,easily to be printed. In any case, all competitors participate in their sole responsibility. The organizers have no responsibility for what happens on HEALTH issues and is due to a lack of preventive medical check-ups. In the race there will be medical coverage with an ambulance presence as well as primary care. It is recommended that the participants have recently undergone medical examination. The organizers will not be asked for medical certificates, since all participants are racing at their own sole responsibility. There will be two bottling water supply stations along the 5th Lycabettus Run as described in the corresponding map of the route. In the race there will be electronic timing with a start / stop checkpoint. The runners will carry the electronic (one-time) timing chip along with their number. The electronic timing of "5th Lycabettus Run" has been taken over by the company - EUROPEAN SPORT EVENTS. Reliable timing with top systems. Free photos of the race. The Lycabettus Run 5.5km & 11km can be attended by people over the age of 18 (born at least in 1999) who are eligible to participate in the race. The Lycabettus Run Trail 4.5km & 9km can be attended by people over the age of 18 (born at least in 1999)who are able to participate in the race. On Lycabettus Run Relay 11 km (Relay 2 x 5.5 km), people over the age of 18 (born at least in 1999)who are able to participate in the race can participate. In the case of participants under the age of 18 (minors) in the Lycabettus Run races, they must have the parental consent of their guardian who will accompany them. Download here the Responsible Parent - Guardian Declaration, which you must send it electronically signed to info@lycabettusrun.gr or deliver it to the race secretariat upon receipt of the participation package. By submitting the Responsible Parent - Guardian Declaration, it is assumed that the parent's consent for participation in the race has been given. Each runner participates in the event on his own free will. 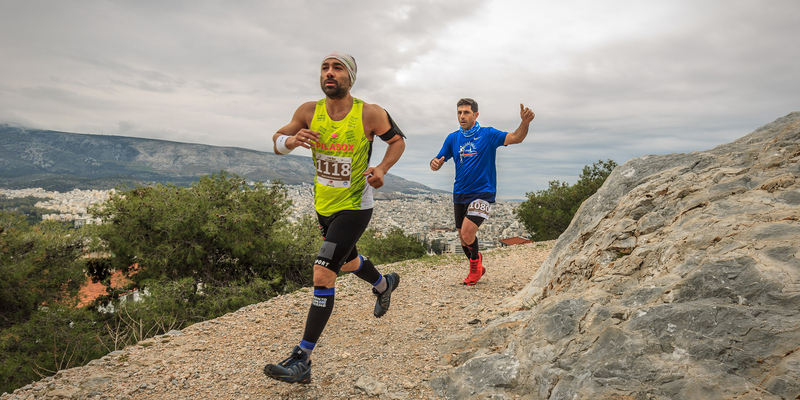 Participants in the Lycabettus Run are fully aware of and have thought the dangers of their participation in the event, in terms of their possible adverse health effects. Each runner participates in the event on his own responsibility and bears full responsibility for his participation concerning his fitness and ability to participate. The Organizing Committee of the Race does not bear any responsibility in the event of death, injury, damage or any other damage that may be suffered by any participant or viewer in the event , both during his or her arrival, duration or departure. Lycabettus Run can only be joined by those who have made a valid and timely subscription. Participating runners must have their entry number,which they have been given, in the front of their chest. In any other case they are likely to be excluded from the race. All participants must respect and observe the rules of the race throughout its course as well as before and after. The Lycabettus Run will take place on the day set regardless of the weather. Only in the event of extraordinary circumstances is the organizing committee of the race entitled to decide to postpone the start or to cancel the race according to the prevailing circumstances. In such a case, the participation fee of the race is not returned to the registered runners. The Organizing Committee of the event reserves the right to change the race schedule, the terms and regulations for participation and the race without prior notice. Participants in the event consent to the use of their image during the race by the organizers, sponsors or other partners of the event for the purpose of this promotion, without any entitlement to full or partial compensation for this reason. The decisions of the Organizing Committee of Lycabettus Run can not in any case be the subject of litigation. The Organizing Committee of Lycabettus Run has the right to suspend or close the entries without prior notice. Signing up in one of the routes of Lycabettus Run is possible only through the online sign-up platform available on the website of the event. The Registration is valid only on condition that the payment of the participation fee has been made as determined on the day of registration and the relevant amount has been credited to the organizing account. Registrations for which no full payment has been made within three (3) working days of the submission of the application form are canceled without prior notice. Changes to confirmed registrations (runner replacement, race change) are not possible after the closing of the registration period for each race of the event separately or after a specific date announced by the Organizing Committee. Once the registration is confirmed, no change can be made to the selected t-shirt size on the part of the runner. which they will choose when registering, the days and times are to be announced, identity card or other legal identification document (eg passport, driving license). The registered runner may authorize another person to receive the personal number and participation package either by authorization bearing a certificate of genuine signature or by simple authorization, under his own responsibility and only if his or her representative carries with him the identity or other legal identification document (eg passport, driving license) of the registered runner. Replacement of runners and / or change of distance of the race, selected by the individual participant are not possible in any case upon receipt of the numbers and participation packages. Only the updating of the details of the already registered runner and the correction of his or her personal details can be organized in the organizing secretariat. Entry numbers and / or participation packages are not sent in any way by post or in any other way to the beneficiaries. Participants must follow the instructions of the organizers, volunteers and staff of the event, including calls to leave the route and stop the race. Any breach or non-compliance with the rules of the race will result in the participant being excluded from the race and being eliminated from the results of the race without any compensation. The participation number is personal and is not transferred or given to another runner under any circumstances. Access to the race, the start and finish area is not allowed in any case to non-validly registered runners (people without a valid entry number). The use of a bicycle or other means of transport is not allowed during the race on the route, either it is for a runner or other accompanying person. In such a case, the directly involved participant is excluded from the race and is called to leave the event immediately. The completion limit for all Lycabettus Run runs is set at two (2) hours from the start of the race (10.00am). After the lapse of time, each runner will be running on his own responsibility. The organizers are not responsible for anything that occurs along the course of the race after the expiry of the aforementioned time limit. Official time is the time that starts with the signal of the starter in the starting point. Net time is the time that counts from the time each participant passes the boot carpet to its finish. The ranking of the race results from the official ending times. Net time and intermediate times are only reported to update the runner. The route is mainly dirt road, with St George Lycabettus Hotel the starting and finishing point. The runners will move into the Lycabettus Hill and extending to the top. At the Lycabettus Relay 11 km (11,000 meters) relay, each team will consist of 2 athletes each with a distance of 5,500 meters (2 turns - 2 x 2,750 meters). Of 2 male and female athletes for the mixed class. In the mixed category the structure of each group can be composed of 1 man and 1 woman. In each category there will be a separate ranking and award for the first three groups. The red number will be carried by the first athlete of each team, ie he / she will travel (2 turns - 2 x 2.750 m) the distance from start to the first 5,500 m.
The blue number from the second athlete of each team, ie he / she who will travel (2 turns - 2 x 2.750m) the distance from the 5.500m. up to 11,000 m.
Note: All changes to the baton will be made at the starting and ending point, which is the same as the route is circular, in front of the St.George Lycabettus Hotel (Hotel of the event). The start will be given in front of the St.George Lycabettus Hotel and the athletes will follow a clockwise route on the Lycabettus ring road. The athletes of each team during the change process will have to traverse together hand-hand (that is,at the same time) ten meters ahead and ten meters after the electronic timing elastic mat, as a distance checkpoint. All points of change are in the same place. That is, in front of St. George Lycabettus Hotel. The first athletes with the red number of each relay group will have to be 30 minutes before the start of the relay race. The second athletes with the blue number of each group must be 10 to 15 minutes after the start time of the first change. 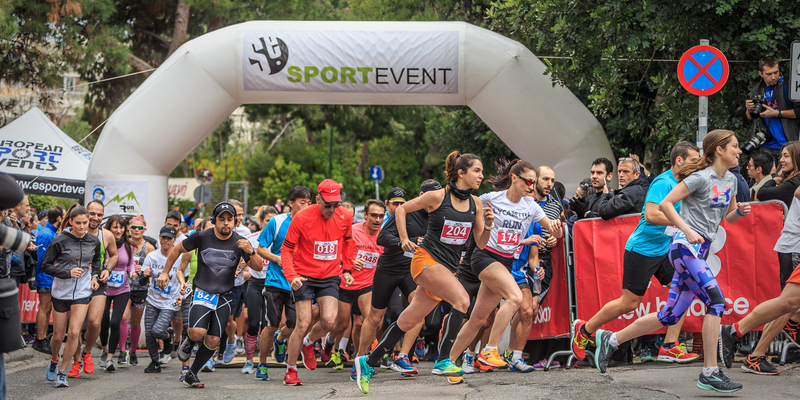 Sportevent is active in the field of organizing sporting events and was established in order to provide the modern or prospective athlete the opportunity to participate on a continuous basis in safe and quality races. With a privileged location, St. George Lycabettus hotel is located at the bottom of the piny slopes of Lycabettus Hill offering unrivaled view of the Acropolis, and panoramic view of Athens, Lycabettus and the Saronic Gulf islands. Meeting point St George Lycabettus Lifestyle Hotel. You can pick up the Bib numbers and the T-shirts at one of the 3 pickup points you have stated in your registration form. On Sunday the front desk will be closed. No pickup, changes or new registrations will be performed! For the runners coming from outside of Athens there will be an exclusive front desk on the day of the race in the lobby of St George Lycabettus Lifestyle Hotel, operating for the pick up of bib numbers and t-shirts from 08:00 to 09:00 a.m. Awards and ballots after the end of the race! Επειδή η απόλαυση μιας AMSTEL δεν υπακούει σε περιορισμούς, η μπίρα AMSTEL Free είναι εδώ! Η πρώτη μπίρα ελληνικής παραγωγής με 0,0% αλκοόλ και μόλις 25 θερμίδες/100ml, έχει δημιουργηθεί από τους έμπειρους ζυθοποιούς μας ώστε να μην της λείπει τίποτα εκτός από το αλκοόλ – και λίγες θερμίδες. Φυσικές βύνες κριθαριού και σιταριού συνδυάζονται απολαυστικά σε μία δροσιστική μπίρα, για να μπορείς να απολαμβάνεις τη γεύση AMSTEL όπως και όποτε τη θέλεις! Three Heart Superbar series of Greek-made grain cereal bars are created to be a delicious, delicious and healthy snack for every moment of the day. Η New Balance ξεκίνησε με έδρα την Βοστώνη, ως εταιρεία με υποστηρικτικές καμάρες στις αρχές της δεκαετίας του 1900. Το 1970 εξειδικεύτηκε στην παραγωγή αθλητικών παπουτσιών και πλέον έχει εξελιχθεί σε μια από τις κορυφαίες διεθνής εταιρείες αθλητικών ειδών. Το Powerade είναι το ισοτονικό ποτό των μεγαλύτερων αθλητικών διοργανώσεων παγκοσμίως! Παρέχει τρία συστατικά απαραίτητα σε όσους ασκούνται: νερό για «σωστή» ενυδάτωση, υδατάνθρακες για ενέργεια και ηλεκτρολύτες (νάτριο, κάλιο), καθώς μέσω της άσκησης και της εφίδρωσης χάνονται πολύτιμα άλατα, δηλαδή ηλεκτρολύτες, από τον οργανισμό. Τα προϊόντα της ZIPVIT είναι ειδικά σχεδιασμένα συμπληρώματα διατροφής τα οποία δημιουργήθηκαν για να καλύπτουν τις ανάγκες των αθλητών, ερασιτεχνών, επαγγελματιών και ελίτ σε όλο τον κόσμο. Χειροποίητοι σκελετοί γυαλιών ηλίου και οράσεως από ξύλο. Ένα τεχνούργηµα που προέρχεται από τη σύζευξη της καλής τεχνικής, της προσοχής και της φροντίδας τόσο για τα υλικά σου όσο και για το τελικό δηµιούργηµα. Το Cryosauna studio της Icetube προσφέρει τον ιδανικό, εύκολο και γρήγορο τρόπο για αύξηση δύναμης, αντοχής και ευλυγισίας. Μπες και εσύ τώρα στην Κρυοσάουνα και γνώρισε τον κόσμο της Ολόσωμης Κρυοθεραπείας. Το Κρι Κρι Super Spoon είναι το πρώτο στραγγιστό γιαούρτι 0%, με υψηλή περιεκτικότητα σε πρωτεΐνη και τις μοναδικές ιδιότητες των superfoods. Το Super Spoon αποτελεί τη σύγχρονη πρόταση που σου χαρίζει δύναμη, ενέργεια και απόλαυση σε κάθε κουταλιά! H Life Ergo με έδρα το προπονητήριο του Ολυμπιακού Σταδίου παρέχει υψηλού επιπέδου υπηρεσίες εργομέτρησης. Η ομάδα του εργομετρικού κέντρου, αποτελείται από άρτια καταρτισμένα άτομα, με υψηλό επίπεδο επιστημονικής ειδίκευσης & γνώσης, προσαρμοσμένο στις σύγχρονες απαιτήσεις του αθλητισμού & της αποκατάστασης. Η Cosmos Sport, είναι η Νο1 ελληνική αλυσίδα πώλησης επώνυμων αθλητικών ειδών με 15 φυσικά καταστήματα και το μεγαλύτερο e-shop cosmossport.gr. Specialized Road Shop. Track - Road - Mountain. Shoes (Motion Analysis) - Clothes - Nutritional - Watches - Glasses - Blackroll. Top Cycles is one of the best bicycle stores that also has a wide variety of quality clothing and footwear for runners and triathletes, providing specialized and racing solutions. It is located in Peristeri a few meters from the station of Ag. Antonius. «Τίποτε από μόνο του δεν είναι καλό ή κακό – η σκέψη μας το κάνει τέτοιο» - Σαίξπηρ. Για μια ολοκληρωμένη και στη μέγιστη απόδοση ψυχολογία ενημερωθείτε από το www.idealpsychology.gr και εκφράστε οτιδήποτε σας απασχολεί. Η One Beauty παρουσιάστηκε πρώτη φορά στην αγορά το 2014 δημιουργώντας το Exeis ena lastixaki?. Από το 2016, εισάγει και διανέμει τις εταιρείες MOXIE, DrPAWPAW, Hawkins and Brimble. Σκοπός της να παρουσιάζει στην ελληνική αγορά προϊόντα ξεχωριστά ως προς τη συσκευασία τους, φυσικά ως προς τη σύστασή τους, αποτελεσματικά ως προς τη χρήση τους, κατάλληλα για vegan και που δεν δοκιμάζονται σε ζώα. Η Aegeo Spas, ο μεγαλύτερος όμιλος διαχείρισης κέντρων ευεξίας στην Ελλάδα, σε περισσότερα από 155 Ξενοδοχεία, σας προσφέρει υψηλού επιπέδου υπηρεσίες στο St George Lycabettus Hotel με στόχο την απολυτη χαλάρωση του σώματος και αναζωογόνηση των αισθήσεων. Ο Όμιλος Εταιρειών Υγείας ΒΙΟΙΑΤΡΙΚΗ δραστηριοποιείται στον κλάδο των ιατρικών υπηρεσιών υγείας από το 1981. Σήμερα αποτελεί τον κορυφαίο ιδιωτικό φορέα παροχής ιατρικών υπηρεσιών πρωτοβάθμιας περίθαλψης στην Ελλάδα με 49 αυτόνομα Διαγνωστικά Κέντρα σε Ελλάδα και 15 σε Κύπρο συνολικής έκτασης άνω των 44.700 τμ. που δέχονται περισσότερες από 2.800.000 επισκέψεις το χρόνο. Η υπηρεσία Viva Wallet αναπτύχθηκε από την εταιρεία Viva Υπηρεσίες Πληρωμών ΑΕ, ίδρυμα έκδοσης ηλεκτρονικού χρήματος και λειτουργεί με επίσημη άδεια από την Τράπεζα της Ελλάδος ως Ίδρυμα Έκδοσης Ηλεκτρονικού Χρήματος για λειτουργία εντός EOX-31. Η RaceFinder.gr είναι ο νέος και πρωτοποριακός τρόπος ενημέρωσης αθλητών για αγώνες, αλλά και για τις εγγραφές τους σε αυτούς που τους ενδιαφέρουν! Είμαστε πάντα στην διάθεση όλων όσων αγαπούν τον αθλητισμό! On the Daenokratous Street 1A in Kolonaki in about 2 months will be the venue for the beginning of the Museum of Greek Tourism, the mark of which has been created by Alekos Fassianos. Η «ΣΥΜΜΑΧΙΑ ΓΙΑ ΤΗΝ ΕΛΛΑΔΑ» ξεκίνησε το 2010 ως πρωτοβουλία των θεσμικών φορέων του κλάδου της επικοινωνίας, με άξονες δράσης τον πολιτισμό, τον αθλητισμό, τον τουρισμό, το περιβάλλον και τον εθελοντισμό. In 2011, the group of Volunteer Samaritans, Rescuers and Lifeguards of the Greek Red Cross, completed the 80 years of uninterrupted social and humanitarian offer. There’s no better place to experience all that Athens has to offer than from our Lifestyle boutique hotel in the center of the city. Nestled against the pine-forested slopes of Lycabettus Hill, the St George Lycabettus affords breath-taking panoramic views over Athens to the Acropolis and the Saronic Gulf beyond. Guests are also perfectly positioned right in the pulsing heart of Athens, just steps away from Kolonaki’s alluring shops, museums, galleries and eateries. Family-run since its inception, the St George Lycabettus Hotel is regarded as a landmark of Greek hospitality, with its intuitive service and sleek, newly-renovated rooms. We invite you to stay with us on your next visit to Greece!